The author (photographer and publisher) of this publication has made it more than just an ordinary guidebook. It is meant to be a souvenir, an object to treasure, illustrating the Lakes with more than one image of each, and portrays them in different seasons and weathers. He also takes us beyond the lakes, the streams and the mountains, to estuaries and the coast that lies not far beyond. He also gives us a different visual perspective by including traditional and contemporary paintings and also touring maps that provide extra value, and an immense amount of detail rarely found in similar material. Writing a comprehensive personal guide is difficult. William knows the area “as writer, photographer, climber and walker, and a holidaymaker” with his wife and children. He also knows the area as a cyclist and motorist. However, he needs to cram this wealth of information and experience into comparatively few pages. In so doing, he has to inspire as well as inform. The inspiration comes from the photographs. Most are his own, taken, I imagine, over a period of many years, catching the lakes and the fells in their varying seasonal moods, reflecting sunshine and shower. A troubled Wasdale is caught beneath purple threatening clouds. The road down into Eskdale is captured in the autumn sunshine. Buttermere was photographed on a day of serene stillness, when the waters were as still as a silver mirror and the trees at Elterwater are translucent in the wintry light. But there is also room for a picture of a twisted, blighted tree on the shores of the lake, for eight or so pictures of some of the stones on Castlerigg, and for interiors at Mirehouse and Muncaster Castle. There is even space for a picture of one of the sumptuous, beswagged bedrooms at Sharrow Bay on Ullswater. Another source of inspiration, and an original feature of the book, is the reproductions of landscape paintings by local artists. Alison Crichlaw has painted Styhead Gill in bold storkes of vibrant colours, clashing reds and purples and thick, tangible brushstrokes of greying white. Jon Trotman uses similarly bright colours to warm three climbers on a cold and wintery peak. The information comes from the excellent maps and from William Fricker’s concise text. Ambitiously he has sought to cram in the multitudinous minutiae that tourists require, everything from best walking routes to motor tours to bed and breakfasts, and to supply opinions and advice as well. As a consequence, the print is small, and the entries brief. Keswick is “The Queen of Lakeland” and has “a profusion of outdoor shops” and “an abundance of B&Bs with many now in urgent need of refurbishment.” Even the austere Alfred Wainwright becomes a very matey “the great Alf Wainwright”. Among all this great wealth of detail, the bed and breakfast to be found at High Close Farm on Bassenthwaite looks as though it must be rather special. In a succinct note we are informed that, “Deborah is a delight and has a flair for the unexpected and an eye for detail with quirky touches in the bedrooms. Her bacon is just yummy.” The Farmer’s Arms in Portinscale offers “creatively cut sandwiches”. It is good to see a Lakes guide that is not afraid of stepping further afield. Looking to the west coast the book recommends the industrial and shipbuilding heritage, the coastal walks and the historic towns and architecture. It even suggests a visit to the windfarms at Oldside and Siddick to decide whether windfarms are “ a blight on the landscape or strangely beautiful”. 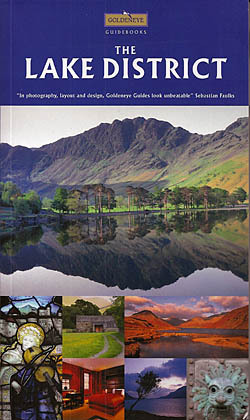 William adds an enterprising list of Lakeland celebrities,that includes not only everyone from William Wordwsworth to Melkvyn Bragg, but manages to find room for “Wilk” Wilkinson, the Keswick cartoonist, John Cuncliffe, the author of Postman Pat and for the Herdwick sheep, which he describes as “Lakeland’s gardener”. William Fricker has produced an attractive guide that might have prompted John Ruskin to climb into his carriage and drive through the lanes or clamber aboard his rowing boat and pull hard for the far shores of Coniston.